Alphabet's moonshot factory, X (formerly "Google X"), is a secretive place, but it seems that when they are close to graduating a project, then they need to staff it up quickly. Watching for these job ads is one easy way to know they're close to budding off a baby. The X division is like a comfortable incubator, mostly protected from the corporate bean counters, but there comes a time when the chicks have to leave the nest and start making money in the real world. Shareholders can only tolerate so much R&D spending before they get antsy about how their dollars are used up. 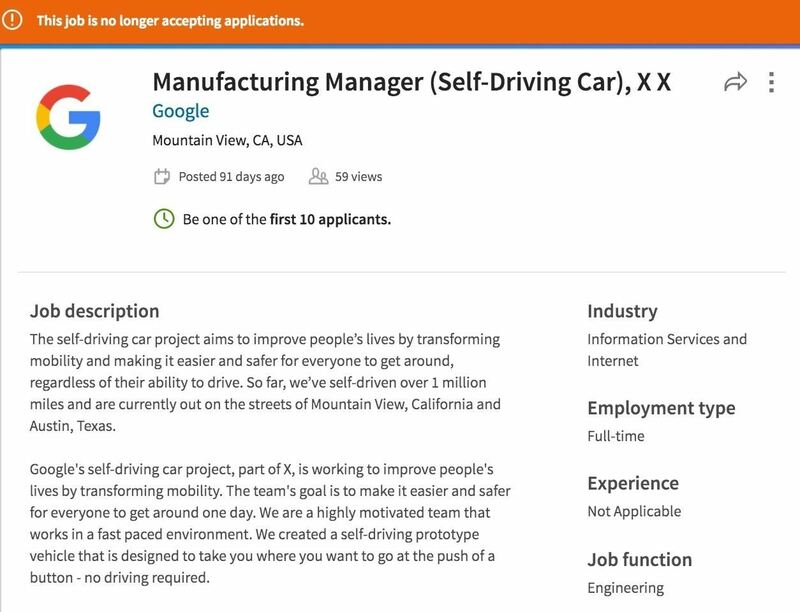 The recent job ads make it looks like their fledgling self-driving car moonshot (moonshots are what they call projects) is revving up to leave the nest; There are currently 27 open jobs on Google's Careers site for the project. …while I'm very proud of some of the things that have already graduated from X—the self-driving cars. This in itself is a profound statement, as it may imply that the development of Google's autonomous driving system is already sufficiently advanced enough that it has moved from research into the refinement stage. If true, then this would firmly establish the Google Self-Driving Car Project as the most advanced technology in this sector that is probably ready for a major pilot project on public roads. While recent job postings for the Self-Driving Car team still show it being within X, they do provide some hints at Google's (who says look at that Alphabet car?) timeline for the project's breakout. Our path forward includes significant growth in both team size and geographical footprint. Experience working with laboratory and manufacturing spaces, as well as leading build outs. 'We're really focused on working with partners,' [Sergey] Brin told journalists. 'Even though we said we built this one ourselves, we're enlisting many partners.' He stressed the existing relationship with auto parts suppliers and mentioned possible tie-ups with bigger manufacturers. Plan capacity, budgeting and overall factory readiness for operations related to final assembly of the self-driving car electronic modules. WonderHowTo talked to an anonymous source within a major motor manufacturer who said the details within this job posting suggested that the Self-Driving Car Project was about 12-18 months away from production of the self-driving modules. New hires aren't the only additions to Google's Self-Driving Car team. Other very senior hires within Google are supporting this project team, either indirectly or directly, including Alan Mullaly (Google Board of Directors), John Krafcik (CEO, Google Self-Driving Cars), and Shaun Stewart (Director, Google Self-Driving Cars). In September 2006, soon after being passed over for CEO at Boeing, Mullaly was named CEO of Ford Motor Company. He successfully led Ford for 8 years, including through the recession, before he resigned in July 2014. Mulally joined the Google Board of Directors a week later. Krafcik also worked at Ford for 14 years before joining Hyundai in 2004 where he stayed until the end of 2013, ending his employment as CEO and President of Hyundai Motor America. After a brief stint as President of TrueCar, he joined Google in September 2015. Unlike the other two executives, Stewart is not a veteran of the automotive industry, but adds complementary skills from the sharing economy and his specialization in building and scaling businesses that he gained as Global Head of Vacation Rentals at Airbnb. Putting these jigsaw pieces into place appears that Alphabet is close to the commercialization of Self-Driving Car technology and are gearing up for expansion of the project to a much larger scale. Their preparations for the manufacture of the self-driving car module leaves their options open to partner with automakers, or to build their own vehicle with automotive Tier 1 suppliers if no automaker partners can be found. The addition of Stewart, with his vacation rental experience from Airbnb, suggests that Alphabet may be prepping to roll out some form of transportation-as-a-service (TaaS) pilot project rather than manufacturing and selling private cars. In a TaaS model, a user would typically use their smart device to order a vehicle when they need it, pay in advance electronically, and then off-hire the vehicle at their journey's end. Very much like Uber on steroids, except the car's automation could cut the cost to half that of a typical taxi with driver. Therefore, do not be surprised if you see a major Self-Driving Car pilot project on US roads within the next few months while, behind the scenes, the Alphabet team prepares to dramatically scale this up over the next one to two years.